(4 minutes) There is no need for owner(s) of micro and small to medium-sized enterprises (MSMEs) to believe that because they are small with no or limited funds for marketing, that online marketing communications technology is out of reach. There should be no obstacles in the way of an MSME to implement a marketing program for business development. In fact, any MSME that is trying to establish itself without online (or offline) marketing is doomed. There are fundamental assumptions for a MSME to engage in online marketing. It is assumed that the enterprise has a computer, the owner/partner(s) have a working knowledge of word software, connection to the Internet, and is familiar with email. The first hurdle to clear is to set up an email database. These can be as simple as a group archived on an email program such as MS Outlook. There are, however, free email marketing automation platforms with limited service like Mailchimp. The free accounts that include a database file for email and a few newsletter templates are good enough to start an email marketing campaign to prospects and clients. In addition, the campaign will generate basic metrics. Client surveys are easy and free, if an MSME were to set up a SurveyMonkey account. Again, the service is limited, but with a few questions and automated analysis of the returned data, much can be learned and turned into information and then knowledge that can be used in a marketing tactic. There are free accounts for a Facebook business site and, of course, personal accounts. Facebook can serve as a website for a micro or small business while funds are secured to build a standard business website and/or blog. LinkedIn offers free company pages and group pages, and marketing tactics options work well with an integrated online presence using Facebook and LinkedIn. Facebook and LinkedIn free sites do generate metrics that when combined with data from client surveys can assist with business decisions. WordPress offers free sites, but there is a cost for hosting services and registering a website name and URL that may impact the decision to engage in online marketing. There are other options if one were to take the time for researching the possibilities of an online presence. With Facebook and LinkedIn, an entrepreneur can link a newsletter URL to posts and discussions, show photos and video, record and post live chats and then once posted, link posts that might appeal to prospects and clients in the next newsletter. A free Twitter account can expand the communications network of a micro or small to medium sized enterprise even further. Marketing is competitive when played according to rules and decided by skill, strength, and being in the right place at the right time. Building networks online does not have to deplete limited resources and can be accomplished with basic equipment and skills. Marketing communications technology is available to all MSMEs who really want it. (3 minutes) Consulting marketers often take the path of experience and preference when developing creative design, tactics and strategy. They may default to opinions and recommendations that once worked well, and expected to work again given similar circumstances, or experience with a past client. Business environments change and so do audiences. Perhaps an industry once dominated by Baby Boomer owners and senior managers has shifted to ownership and management of Generation X. There is a high likelihood that promotions that once worked well, will not resonate a second time. Because Generation X is quickly moving into voids left by retiring and passing Boomers, marketing to the Baby Boomer Generation is being overlooked in favour of Generations X and Y. Boomers are still influencers in business and the consumer marketplace. The challenge is how to penetrate markets frequented by Boomers and effect sales of products and services. This is not easy and a complex process of mind association and making sense of what “the numbers” can tell the marketer. To take personal/team subjectivity and emotional reaction out of marketing assignments, marketers must first undertake research that will generate statistical data that can be transcribed into information, then knowledge – and if the research is good enough – an element of wisdom. In the case of working with a Boomer target audience, a first level of data collection might be local demographics to determine the size of the target audience, its level of disposable income and capability to purchase a service or product. A very basic study of the Town of Halton Hills in Ontario suggests that Boomers are now aged 72 to 54. In a 2011 population of 59,000, there were approximately 10,500 Boomers or 18% of the population (1/5 people). In 2010, one in ten non-family seniors lived in low income, suggesting that there were approximately 9,000 Boomers with disposable income. Now the marketer is on her/his way to craft a marketing strategy and series of tactics. But there is much more to do, like answering where are they (geographic nodes); what are they buying (products/services); where do they buy (place); how much do they spend on a specific purchase (price); and what attracts them to make a purchase (promotion)? One way of understanding these questions is to understand what it is that would trigger an emotional appeal that would connect to a product or service offering. A beginning might be to understand life-defining events that would trigger an emotion through a memory that only a Boomer could have. These would include such memories as parent/grandparent stories of the Great Depression and WWII; the Suez crisis; the Cold War and Cuba Missile Crisis; the JFK assassination; the Vietnam War; Expo 67; the young Pierre Trudeau years; FLQ crisis; rock’n roll (Elvis and the Beatles); civil rights; and recession of early 1980s with 18/20% mortgage rates. All of these trigger some level of latent emotion in Boomers. The challenge is how to harness emotions to build a trusting relationship prior to effecting a sale. And there is the goal of the Boomer Generation that the marketer must not forget. The Boomer Generation wants to leave their stamp on things. They want to be remembered. (4 minutes) A trap that many marketers and owners of small businesses can fall into is ignoring the life cycle of generations X, Y and Boomers and the entry of the igen into the marketplace. As people age, among many other things, they tend to carry comfort items with them, including relationships, ways to communicate, habits, opinions, and the vernacular of their generation. Gauging the wants and needs of individuals as they move through careers and life cycle, and how they receive and store information that will trigger a decision are modern challenges for marketers. Marketers are foolish if they think that a single strategy and handful of tactics will generate significant results on social media. By 2020, it is expected that approximately 70% of all humans will own a smartphone. Generation X spends more time on social media than Gen Y, and Gen X has a very high rate of brand loyalty. To many people, mobile devices are now integrated into life styles, family networks and business practices. Gen Y tends to ignore advertising in magazines or on television and expects to be able to seamlessly move across digital channels. That means live chat on websites, Facebook Messenger, Tweets, GIfs and video, and click-to-message options on digital ads to provide a consistent experience. It is already “old school” thinking to believe that keeping a social media fresh with weekly posts of products and applications will be enough to generate interest in an organization. Offline and online communications must be integrated to accommodate seamless movement across digital channels. And, if you think that is going to be challenging, consider the technology that is being introduced to connect groups of organizations on social media platforms to integrate communications worldwide. Marketers must be tech savvy and CEOs/owners, managers, all senior executives must embrace communications technology and understand how it works to lead their organizations into new markets and to grab market share in mature markets. Marketing is a contact sport and needs a strong team to score big wins in the marketplace. Most organizations managed by Boomers and Gen Xers have probably overlooked the next wave entering the marketplace and how they receive messaging at the junior level in their careers. Enter the igen, or frivolously referenced as Gen Z. This generation is forming its values and life markers in the virtual world. Consider these characteristics and how to plan a communications strategy and tactics to trigger a decision. They tend to be blended in race and gender, tech innate, communicate through images, and have a collective consciousness. Born after 1996, igens are graduating from high school/college and entering the workplace. Audiences on social media have expiration dates and they are not homogeneous. A big mistake is being made if you believe a calendar of posts will be enough to grow a presence on social media. Technology must be employed to engage four different generations in the workforce. Complacency with social media strategy and tactics will doom a business’s socmed communications. One of Canada’s oldest professions is also one of Canada’s most exciting careers awaiting graduates of applied science and technical programs of universities and colleges. Girls and boys in STEM (science, technology, engineering, math) learning paths may find that land surveying is the purpose in life that they are seeking. Surveying combines knowledge of math, geography, history, computers, science, planning and law. And when girls and boys achieve competency in these fields of interest, opportunities open that are incredible. On one day, a land surveyor could be working in an office environment discussing land-related issues with engineers and other professionals. The next day, the surveyor could be on site in work boots and a hard hat supervising a crew on a major project in the same community where the office is located or hours away by air travel. Surveyors are engaged in building the infrastructure of the future that includes superhighways, underwater tunnels, massive skyscrapers, residential subdivisions, and just about every other project involving the measurement of land. In addition, surveyors assist researchers, police services and many more professions in mapping and preparing reports. Equipment and software used for data collection and mapping is used to generate a wide range of professional opinions from traditional plans of survey to 3-D and virtual experiences. Surveyors explore and map uncharted places, like the ocean floor or moon’s surface. The services of land surveyors are in demand in all countries, and they work in a variety of environments and cultures, in Canada and abroad. They are often stationed in places where few others get to travel. What can a land surveyor expect? Surveyors settle boundary disputes between neighbours by finding evidence to prove who owns the land. GPS, aerial photos, maps, old deeds, and plans are used to determine the boundary. Lawyers and landowners settle their disputes based on the professional opinion of the professional land surveyor. The professional opinions of land surveyors are used in court as expert testimony to make decisions that impact businesses and land owners. Another work example may be construction of a major 120km gas line to transport fuel to new markets. Using satellites and computer software, surveyors make sure that the gas line is built exactly on the planned alignment. A land surveyor may be engaged in a project where a prominent developer is building a new shopping mall in an empty field. The surveyor determines exactly where the foundations will go and ensures that structures are positioned correctly during construction. The Canadian Government may need a record of the polar ice caps to make ocean travel safe. Land surveyors may work from a plane or boat to measure the changes and chart the ice movements to assist shipping of all sorts. And what can a newly-minted land surveyor expect to earn? Since licenced land surveyors have a rare and highly respected skill, $60,000 to $140,000 or more per year can be expected, and if a young entrepreneur who is a licensed surveyor starts a business with a land surveying as the core service, earning potential is unlimited. An engineer once told me that he didn’t like marketing because the word reminded him of going shopping for cabbages. I guess he didn’t like cabbages. The same engineer was respected in his community for the work his office did. Like many other post-war small business entrepreneurs, he had to compete for new work as he completed the work he had. He knew that his next project depended on how well his office performed on existing assignments. The scope of work and fees for service were negotiated when it was his turn to get an assignment. Sounds like an ideal situation for an entrepreneur. This was the way clients once approached professional businesses for services. The “new economy” of 1998 promised exciting times for many small businesses. Inadequate funding of projects, low bidding between professionals to get work, and keeping skilled staff and offices functioning with fast changing technologies were not easy challenges to meet. Founding principals, with large share holdings in firms with declining revenues and profits, took the decision to retire while their firms faced these challenges. This sometimes resulted in strained cash resources for normal operations, after large share purchases by the firms. And don’t forget the baby boomers, moving into the professions, opening new businesses and competing for fewer dollars and fewer clients with shovel-ready projects. Throughout all of this, a major recession struck hard at Canadians. So, what’s this got to do cabbages and professional services? And where do golf balls enter into the picture? Survival, that’s what. Just as the noble cabbage has nourished humankind throughout four millennia, carefully planned marketing will carry professional service businesses through this time of transition to a new knowledge-driven economy. As with business, the cabbage has short – and long-term aspirations. It forms cabbage heads one year, and flowers the next. Left unharvested, the cabbage will bolt into and extended flowering stalk the second year. Some can be harvested for immediate nutrition, but some must be left to provide seed for future plantings. Like small businesses, the cabbage should be grown in fertile ground and tended with care. Golf became a booming industry, supported by merchandising and high profile promotion, new golf course development, and the boomers and their offspring (Gen X) who raised the sport to one of high social esteem. Golf holds lessons to be learned by young entrepreneurs. Looking back over forty years at the success of a little boy selling golf balls in a growth market in the book Cabbages and Golf Balls, helps illustrate the techniques to successfully market a small professional business. Marketing now is considered by many businesses to be as important as the very technology, or service that defines the operation. 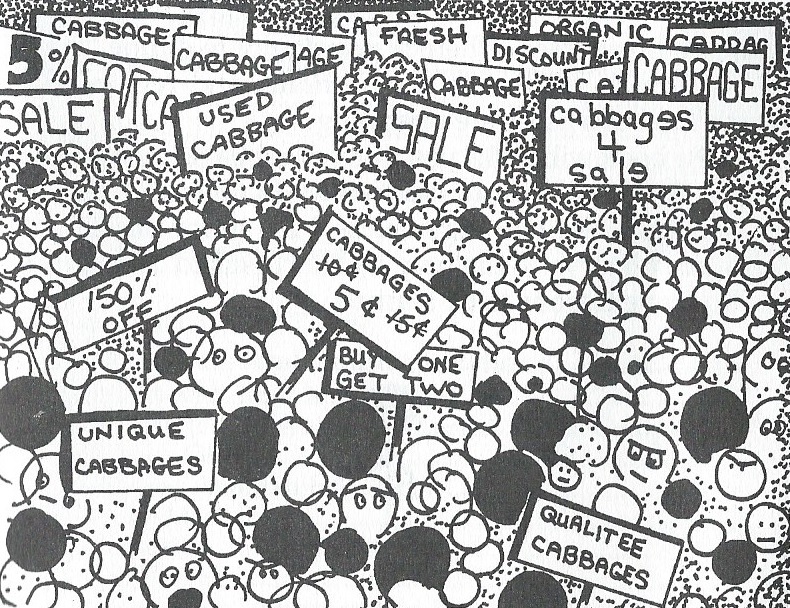 The shopping trip to the marketplace might seem to be a regular visit to sell quality cabbages. If we think cabbages and golf balls, marketing can be fun, and definitely rewarding. Marketing generates new business, and reminds clients of past performance. Marketing is as enjoyable as the sweetest cabbage recipe. Cabbages and Golf Balls, is a philosophy of effective marketing techniques for small professional business when the Internet was in its infancy, there were no smart phones, and social media was in the minds of very few. The book makes no attempt to define “small,” because the term is relative to the economy and region within which businesses are operating. 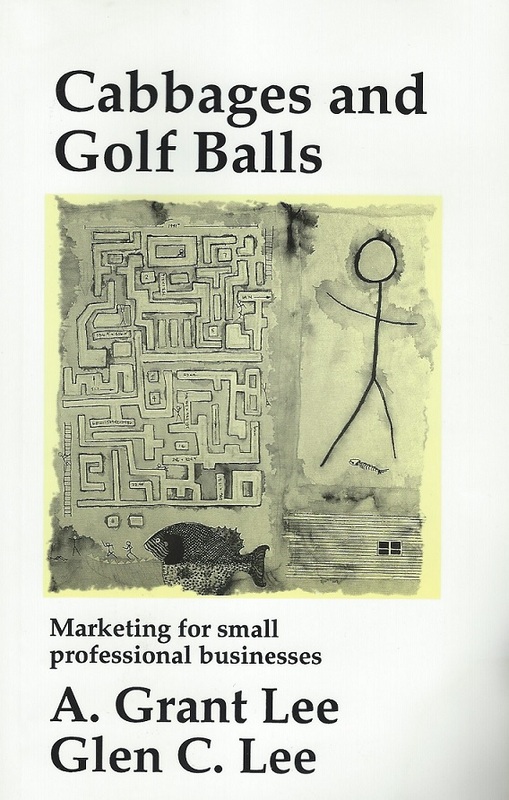 The book makes the reader think about cabbages and golf balls when someone mentions marketing. By the way, in the late eighties, both the old engineer and his office passed painfully into history. To the very end, the engineer disliked cabbage. But, he did leave lessons to be learned.